Every January 1st, we all think to ourselves, "How can this year be different? What do I want to accomplish/improve/change in the upcoming year?" We then proceed to plan out our highly ambitious, nearly impossible goals or resolutions to achieve. Unfortunately a majority of us fall miserably short, chuck it up to "This is too hard", and resume our previous behavior all before the end of January. So it's not surprising that 80% of resolutions fail by February. Why is that? Why do we consciously torture ourselves with ambitious goals only to sabotage all of our efforts and fall back to our normal habits? Are we all secretly gluttons for punishment or do we lack motivation, focus and drive? 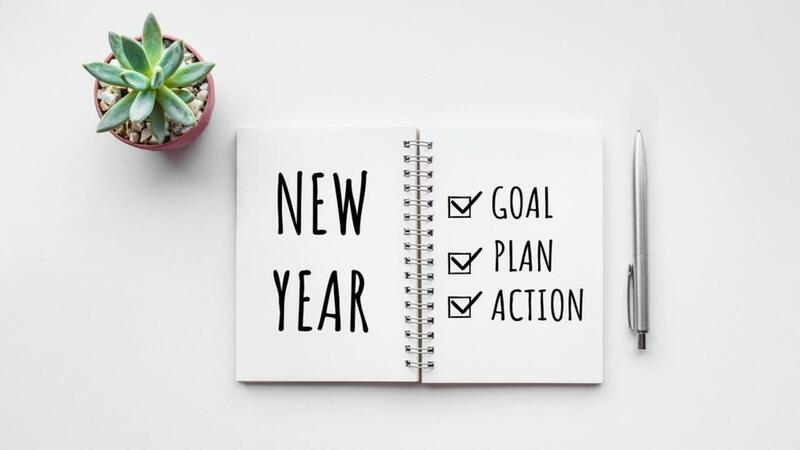 In this blog post, I'll share with you three strategies to help you overcome the 80% failure rate so that you can successfully achieve your goals/resolutions for the new year. A common mistake that happens to people is that we tend to set highly ambitious goals right from the get-go. Let's say for example, you want to lose weight in the upcoming new year (weight loss is the #1 resolution every year). So you devise a plan to join a gym, cut out fast food or unhealthy food, drink more water and less soda, and eat more fruits and vegetables. So right there we have four new behavior modifications that are completely new to you. You attempt all four behaviors and do pretty decent at it for about a couple of weeks. Then, life happens. You don't go to the gym, or you're too tired from the day so you order out food, or you need a 'pick-me-up' so you fall back to your soda habit. The next thing you know, you've failed at all four new behaviors and you're right back to your old habits. You see, most people take on all four at the same time and that's where a majority of people fail. This is a classic case of overwhelm. You have unintentionally overwhelmed your brain to develop new habits when you set out with the best of intentions. Strategy #1: Avoid setting overly ambitious goals. That might sound counterproductive but given the example of weight loss previously, overwhelming your brain with too many new habits can set yourself up for failure right from the start. So what do you do? The best strategy is to pick ONE new habit to start. If weight loss is your goal, which habit would be easy for you to start? Joining the gym, cutting back on junk food, drinking more water? Pick one habit and stick with it for 30 days. Be careful not to set highly ambitious goals with the one habit as well. For example, if you wanted to join a gym and you set a goal to go to the gym 6 days a week where you hadn't worked out in months or even years, you will fail miserably. Start off with an achievable yet stretchable goal. Something that will require you to be challenged but you know you can do it. A further example of the gym goal would be to start going to the gym 2 or 3 days a week, if you hadn't worked out in a while. Maintain that habit for 30 days and build from there. Sometimes, we don't give ourselves credit where credit is due. We work hard in achieving a goal for the new year and we sometimes forget how far we've come or even the progress we've made. Or sometimes we get busy and forget to notice the results that have happen. What tool are you using in keeping track of your new habit on a daily basis? A calendar, spreadsheet, check boxes on your daily planner? Having a system or resource for you to use in keeping track of your new habit will increase your success rate in maintaining your new habit. There's a sense of accomplishment when you can reflect on your day and see that notation made where you stuck to your habit. We have a tendency to make mental notes of our habits without writing it down. We forget, get distracted, or don't make the effort to stick to our habit when we don't write it down. When we are intentional with our new habit, writing it down and checking it off, can provide a glimpse of your progress. Even when you don't notice any physical changes, you can look back and see the progress you've made. And that's something to celebrate! It's been said that "We are our own worse enemy". There's nothing more sabotaging to our new habits than our own self-talk. This is a challenge for most of us. We have been conditioned to talk to ourselves in a negative, depreciating way. In fact, 80% of our thoughts are negative. Our minds are tricky and sneaky. We are introducing something new to improve our lives and we fall into a mind-battle with ourselves. The struggle is we are reprogramming our brains by introducing something new. That takes work. It requires conscious effort to develop and stick to a new habit. Notice what is running through your mind when you are too tired to eat healthy or go to the gym. Stop the track of negative self-talk and remind yourself aloud WHY you needed to change and incorporate the new habit. Being intentional and purposeful with the new habit will lead the negative self talk to diminish while you're strengthening the new habit. These strategies are implementable at any stage of your life, not necessarily at the beginning of the year. We all want better, healthier lives. We want to be our best for those that we love and live our best lives. I hope these strategies are easy to incorporate for you so that you can achieve any goal or resolution for your life. Be sure to enter your info correctly to receive up to date strategies, tools and tips to propel you forward in your life.